Following the debut episode of MTV2’s Hip Hop Squares, Tech N9ne fans all around the country hit the web to share their opinions on the Kansas City King’s appearance, but what did Strange Music supporters like XXL make of the season premiere? Not long after the first episode aired, XXL‘s Executive Editor Jayson Rodriguez and Editorial Assistant Calvin Stovall sat down to watch the full episode and provided their hilarious commentary. CS: Tech N9ne got NO love from the contestants. JR: I protest in silence over his slight. Jayson Rodriguez and Calvin Stovell also went on to comment on MGK, Mac Miller, and Ghostface before Calvin needed the rules explained…again. 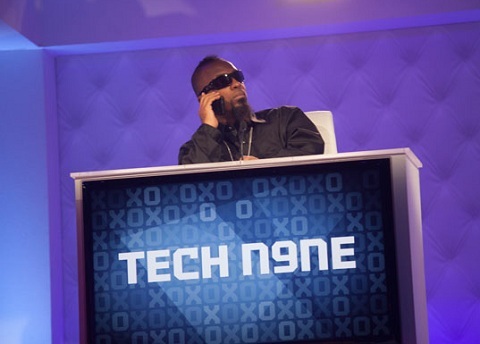 Check out the entertaining commentary from XXL and stay tuned to MTV2 Hip Hop Squares as Tech N9ne is scheduled for two more appearances! What did you think of XXL’s take on episode one?